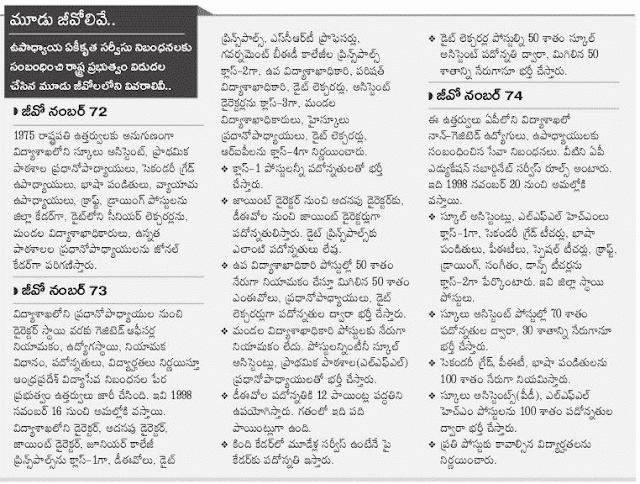 GO.72,GO.73,GO.74 Teachers Common Service Rules, AP Teachers Unified Service Rules, AP Teachers Unified Service Rules GOs for Teacher Promotions, Organization of Local Cadres in the Department of School Education, Unified Service Rules Gazette for amend the Andhra Pradesh Public Employment (Organisation of Local Cadres and Regulation of Direct Recruitment) Order, 1975. G.O.MS.No.72, Dated:20-09-2017 - EDUCATION (SE-Ser.I) DEPARTMENT -GOVERNMENT OF ANDHRA PRADESH - ANDHRA PRADESH PUBLIC EMPLOYMENT (Organisation of Local Cadres & Regulation of Direct Recruitment) Order, 1975 - Organization of Local Cadres in the Department of School Education - Modification Orders - Issued. 1. GO.Ms.No.674, G.A. (SPF-A) , Dt:20.10.1995. 2. GO.Ms.No.675, G.A. (SPF-A) , Dt:20.10.1995. 3. GO. (P) No.728, G.A. (SPF-A) , Dt.01.11.1975. 7. From the Commissioner of School Education, P.,Lr.Rc.No.745/Estt- II/2017, dt:16.09.2017. ORDER: Government of Andhra Pradesh in the reference 4th read above issued orders organizing the categories of post equal to or lower than that of a Junior Assistant, the Non Gazetted categories of posts above that of Junior Assistant for which the unit of appointment was district as District cadre posts as per para 3(1) and para 3(7) of the Presidential Order, other Non Gazetted categories of posts above that of Junior Assistant as zonal cadres as per para 3(2) of the Presidential Order and the specified Gazetted categories of posts as zonal cadre posts. 2. The State of Telangana was formed as a new State from the State of Andhra Pradesh with effect from 02-06-2014 by A.P.Re-organization Act 2014. As per section 97 of the AP Re-organization Act 2014, Article 371-D of the Constitution of India was made applicable to the State of Andhra Pradesh and to the State of Telangana. (2) It shall extend to the whole State of Andhra Pradesh. (3) It shall be deemed to have come into force with effect from the Twentieth day of November, 1998. 2. 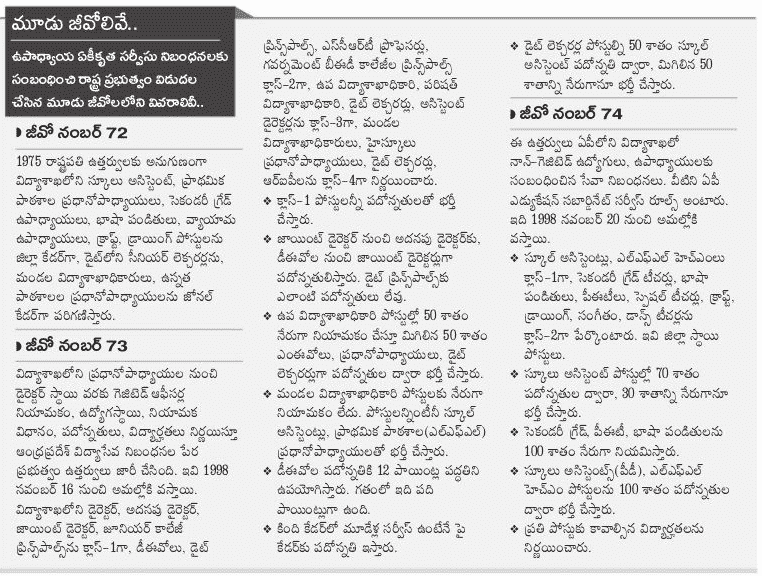 In Andhra Pradesh Public Employment (Organisation of Local Cadres and Regulation of Direct Recruitment) Order, 1975, in paragraph 3, after sub- paragraph (2), the following sub-paragraph shall be inserted, namely : “(2A) The posts belonging to each Non Gazette Category of teachers in Mandal Parishad, Zilla Parishad and Government School in each District shall be organized into a separate integrated cadre.”. EXPLANATORY MEMORANDUM It is certified that no person is adversely affected by making the said Orders effective with retrospective date. By Order and in the Name of the President, [F.No. 21013/1/2004-SR] DILIP KUMAR, Jt. Secy. 4. The order of President of India, G.R.638(E) dated 23rd June 2017 published in the Gazette of India, Extraordinary, Part-II, Section-3, Sub-Section (i) republished by the State of Andhra Pradesh vide G.O.Ms.No.81, GAD, dated 04-07-2017. 5. The State of Andhra Pradesh sent proposals to include certain Gazetted categories of the posts in the Third Schedule of the Presidential Order. The Third Schedule of the Presidential Order was amended by the President of India “the Andhra Pradesh Public Employment (Organization of Local Cadres and Regulation of Direct Recruitment) (Amendment) Order 2017” for specifying certain Gazetted categories of posts as specified Gazetted categories in the Third Schedule of the Presidential Order as per 2(i) of the Presidential Order for organization of those Gazetted categories of the posts into local cadres as per para 3(4) of the Presidential Order vide Notification of Government of India No. G.R.636(E) dated 23-06-2017. (2) It shall extend to the whole State of Andhra Pradesh. (3) It shall deemed to have come into effect from the Sixteenth day of November 1998. It is certified that no person is adversely affected by making the said Orders effective with retrospective date. By Order and in the Name of the President. [F.No. 21013/1/2004-SR] DILIP KUMAR, Jt.Secy. 6. The order of President of India, G.R.636(E) dated 23rd June 2017 published in the Gazette of India, Extraordinary, Part-II, Section-3, Sub-Section (i) republished by the State of Andhra Pradesh vide G.O.Ms.No.82, GAD, dated 04-07-2017. G.O.MS.No. 73 Dated: 20-09-2017 :: GOVERNMENT OF ANDHRA PRADESH - EDUCATION (SE-Ser.I) DEPARTMENT - School Education – Andhra Pradesh Educational Service Rules – Special Rules - Issued. Read: From the Commissioner of School Education, A.P., Lr.Rc.No.745/Estt-II/2017, dt:16.09.2017 & 18.09.2017. ORDER: The following Notification shall be published in the Andhra Pradesh Gazette. CATEGORY-1 : Mandal Education Officer, Head Master and Head Mistress in Government and Zilla Parishad High Schools. CATEGORY-2 : Lecturer, D.I.E.T. CATEGORY-3 : Lecturer in Physical Education, DIET. CATEGORY-4 : Regional Inspector of Physical Education CATEGORY-5 : Lecturer in Fine Arts/Performing Arts, DIET. G.O.MS.No.74 Dated: 20-09-2017 :: GOVERNMENT OF ANDHRA PRADESH - EDUCATION (SE-Ser.I) DEPARTMENT - School Education – Andhra Pradesh Educational Subordinate Service Rules – Special Rules - Issued. i. These rules shall be applicable to Teachers in Mandal Parishads, Zilla Parishads and Government Schools.